Maxi dresses are the rage and in today’s hot colors of turquoise or poppy red, can be dressed up or down and worn for the day or evening. The neutral tones combined with the pastels of tangerine, peach, mango, orange and lemon yellow work incredibly well for summer. But don’t give up on the basic black, white or champagne. These maxi’s act as an anchor piece for the look and you can add incredible jewelry, clutch and shoes in colors of your choice. Blues combined with purple and lavenders are another color blend in solid or patterns that are working for this season. 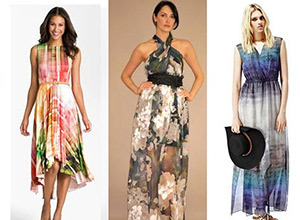 The style of the maxi dress will depend on what the event is. Halters, strapless and single shoulder straps are great for evening and regular or spaghetti strap maxis are perfect for a jacket add on. Some of the most recent runway hits for maxis include the cut out look. It can be a single color, pattern or two-tone, but the cut-out is what takes your breath away. This adds a touch of sizzle to an old school look, bringing it to uptown chic. Another sensual touch is the maxi dress or skirt with a long sultry slit. This is best for evening wear, but the right color and pattern can be a blast at the beach as well. Another word of advice is to be careful with the look and the layering when you wear a maxi. If you choose a simple maxi skirt, paired with a knock out top, don’t over do it with an over-the-top jacket. You just changed what could have been a very sleek, hot look into a train wreck. Keep it simple. If you have an animal print, use a touch of exotic jewelry. If you have an outrageous print, tone down jewelry, shoes and bag. If you have a hot color, keep the rest more subdued. You want the eyes to glide over your style, not jump around trying to figure out what to look at first. This entry was posted by Style Bust on June 26, 2013 at 4:50 pm, and is filed under New Styles in Fashion. Follow any responses to this post through RSS 2.0.Both comments and pings are currently closed.